← Hero of Alexandria: Bringing the Gods to Life. Broken of Body, Sound of Mind: Examining the Reign of the Emperor Claudius. It had been nearly 90 years since Julius Caesar had crossed the Rubicon when Tiberius Claudius Caesar Augustus Germanicus (Claudius) donned the purple as Emperor. The civil wars of the first century BCE had transformed Rome into a mighty Principate- a monarchy ceremonious draped in the tattered rags of the Republic. While Augustus’ reign had brought wealth and stability to much of the known world, within two decades of his death, the Empire hovered on the verge of collapse. The dark, sinister and possibly neurotic reign of Caligula had been disastrous for the Empire . Following Caligula’s assignation at the hands of his own Praetorian Guard was thrust the fifty-one year old Claudius, a man who would not only need to overcome the increasing instability within the empire, but also his own frailties of body. The Assassination of Caligula by Bartolomeo Pinelli (1810). Upon Caligula’s death the empire was thrown into disorder. Unlike the three previous emperors, no imperial decree had been made or offered regarding Caligula’s successor. Some members of Senate considered the Julio-Claudian dynasty to be without issue (heir) and pondered the restoration of the Republic. As the uncle of Caligula and grand nephew of Augustus, Claudius assuredly possessed the blood-right necessary for ascension, but was initially ‘kept’ within the Praetorian camp. Whether he was being kept safe from assassination or as a hostage is unclear. What is certain is that after remaining with the Praetorian Guard for two days that there a popular movement within Rome of those whom wanted the imperial throne restored. After securing the loyalty of army by payment (donativum) of 15,000 sesterces a man, Claudius ascended to the imperial throne as Rome’s fourth Emperor. We get a confused picture of Claudius’ mental faculties during his reign. At times he is referred to as ‘scatter-brained’, ‘shortsighted’ and ‘thoughtless’- at others as, ‘careful’ and ‘keen-witted’. Scholars still debate today, as his contemporaries had during his reign, if Claudius’ range of emotional states and cognitive clarity were the manifestation of some undiagnosed psychopathy. It would not be a stretch to associate many of his ‘attitudes’ and ‘reactions’ as reasonable given both his life experience before and after his ascension to the throne. Suetonius in particular takes exception to Claudius’ early practice of being escorted by ‘javelin-bearing bodyguards’ and being ‘waited upon by soldiers.’  On the surface actions such as these could be seen as paranoid by some, but rather reasonable by others. Claudius had narrowly survived the same assassination attempt which had taken Caligula and had secured the throne only by the offering of donativum, as previously mentioned. Claudius’ vigilance appears to have been warranted. In 48 CE, Claudius’ third wife, Valeria Messalina, would be executed for participation in a plot to remove him from the throne. Marble Statue of Valeria Messalina and the infant Britannicus. “Just because you aren’t paranoid doesn’t mean they aren’t out to get you.” – Colin Soutar. Numerous effigies of Claudius survive into our modern age. None of which better depicts the idealist Roman form than that of his depiction as Jupiter, currently on display in the Vatican, in Rome. Perfect in appearance, Claudius’ form is unmarred by disease or infirmity- a commanding presence. Crowned in laurels as befits an emperor, his left hand holds the sceptrum Augusti– denoting his unquestioned rank as consul and imperator. In his right hand Claudius holds a libations dish, acknowledging his ritualistic connection to the divine. The contrasts are often more nuanced and obscure. Minted in 41-42 AD is the gold aureus, which on its reverse, depicts Claudius in a seated position- a subtle acknowledgement of his frail constitution. Much less complimentary is a image of Claudius on copper coin(s) minted from 41-50 AD, with emphasis placed upon the heavily musculature of his neck- perhaps a reference to his known spasmodic episodes. Others, such as a simple bronze coin bearing the image of the Emperor Claudius- TICLAVD IV SCAESARAVGPMTRPIMP (Claudius 4th Emperor), which on the back bears a depiction of the goddess Spes, bearing an inscription invoking hope (providence) for our Emperor, or perhaps a desperate plea for his continued health. See image below. What can not be debated are the marked changes which Claudius’ rule brought to the Empire- the drainage of Lake Fucine and the building of a harbor at Ostia, completion of new aqueducts and the refurbishment of the Circus Maximus. Each of these works apparently arose out of necessity and not opulence. Claudius appeared practical and handled exigency well, as displayed in his actions during a severe fire of the Aemilian quarter. When it became apparent the fire would not be subdued with the manpower normally available, he ordered people from every district to respond and serve in the firefighting effort, a task for which they were justly compensated. As Emperor, he remained constantly vigilant in regards to Rome’s supply of grain and was always interested in the proper upkeep of the city. This efficiency as an administrator goes far to belie the allegations of reduced mental capacity or vacillation during a crisis. In fact, it demonstrate the ability to prioritize and make quick executive decisions. While not a militarist, Claudius enacted new regulations in regards to the Roman army. Members of the equites, after a proscribed length of service in command of an infantry cohort (typically 480 men), were then required to serve as a Decurion, a commander of a cavalry squadron. Only after these two previous conditions were filled could a posting to military Tribune be made. Claudius also strengthened the separation of the military and the Roman Senate by prohibiting unofficial fraternization between the two groups. Perhaps the most wide-sweeping of Claudius’ reforms was the breaking down of social barriers and cultural stigmatization of Roman Freedmen and slaves. By appointing Freedmen to positions of confidence, Claudius was not only able to surround himself with persons loyal to him, but decrease the stranglehold upon public service by the aristocracy. By imperial decree, Claudius allowed the sons of freedmen to be adopted by equites and thus be able to enter the senatorial ranks. In regards to the treatment of slaves, Claudius ordered that injured and ill slaves had to be given medical treatment rather than be abandoned to die by their masters. Likewise, any slave which had previously so abandoned, only to later have recovered from their illness was set free. Claudius also prohibited the killing of slaves with the intent to deny medical treatment- doing so would be considered murder. These progressive and compassionate acts did much to popularize him the freedmen and plebs, but earned the ire of the patricians. Historians will never know with absolute certainty the exact cause and pathology of Claudius’ neurological disorder(s). Having never been considered for the purple, Claudius in all likelihood would have never found himself thrust into the annals of history, except for a specific chain of events which ended with the death of his nephew Caligula. The exact limitations his disabilities placed upon him are rather unclear but certainly presented challenges almost unimaginable to persons similarly afflicted in antiquity- let alone those who reigned as Emperor of Rome for 13 years. Despite his disabilities, or perhaps because of them, Claudius was a clever and practical leader who surrounded himself with a cadre of loyal soldiers and freedmen whom he could trust and rely upon. Under his leadership, the Roman economy was relatively stable, and practical public works were completed. Whether motivated by populist views or a distrust of the aristocracy, Claudius made numerous social reforms which where in antiquity key points of criticism, but today regarded, by many as a legacy of enlightenment. Armstrong, Keith. “Emperor Claudius I: The Man, His Physical Impairment, and Reactions to It.” Academia.edu. 2013. Accessed March 07, 2015. https://www.academia.edu/4779256/Emperor_Claudius_I_the_man_his_physical_impairment_and_reactions_to_it_by_Keith_Armstrong. Cary, Earnest. “Roman History, 60.” Cassius Dio, Roman History 60. Accessed March 02, 2015. http://lexundria.com/dio/60/cy. Cary, M. A History of Rome down to the Reign of Constantine. 3rd ed. London: Macmillan, 1975. “Claudius as Jupiter.” Roman Emperors. 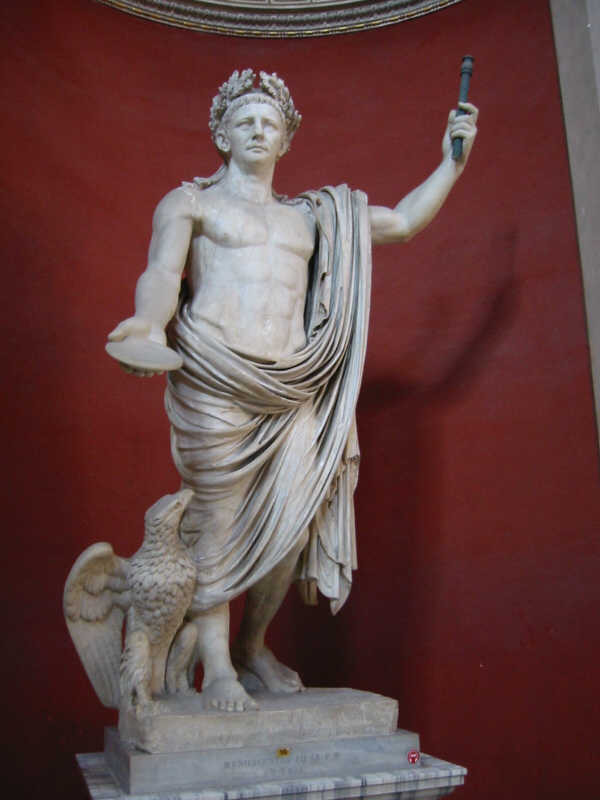 Accessed March 06, 2015. http://www.romanemperors.com/images/claudius/statue-claudius-as-jupiter.jpg. “Claudius Bronze Coin.” Roman Emperors. Accessed March 06, 2015. http://www.romanemperors.com/images/claudius/coin-bronze.jpg. “Claudius Gold Aureus.” Museum Victoria. Accessed March 08, 2015. http%3A%2F%2Fmuseumvictoria.com.au%2Fcollections%2Fitems%2F72633%2Fcoin-aureus-emperor-claudius-ancient-roman-empire-41-42-ad. “Claudius Copper Coin.” Museum Victoria. Accessed March 09, 2015. http://museumvictoria.com.au/collections/items/66398/coin-as-emperor-claudius-ancient-roman-empire-41-50-ad. “Dystonias Fact Sheet.” : National Institute of Neurological Disorders and Stroke (NINDS). Accessed March 08, 2015. http://www.ninds.nih.gov/disorders/dystonias/detail_dystonias.htm. Le Glay, Marcel, Jean-Louis Voisin, and Yann Le Bohec. A History of Rome. Cambridge, MA, USA: Blackwell, 1996. Rice, Jane E. “The Emperor with the Shaking Head: Claudius’ Movement Disorder.” Journal Of The Royal Society Of Medicine 93 (April 2000): 198-201. Shelton, Jo-Ann. As the Romans Did: A Source Book in Roman Social History. 2nd ed. New York: Oxford University Press, 1998. Suetonius, and Robert Graves. The Twelve Caesars. London: Penguin Books, 2007. Le Glay, Marcel, Jean-Louis Voisin, and Yann Le Bohec. A History of Rome. Cambridge, MA, USA: Blackwell, 1996, 262-263. Suetonius, Life of Divus Claudius 2/Graves, 179; all translations of Suetonius are taken from Suetonius: The Twelve Caesars, translated by Robert Graves; revised with an introduction and notes by J. B. Rives (New York: Penguin Books, 2007). [4 & 5] Suetonius, 3-4/Graves, 180. Rice, Jane E. “The Emperor with the Shaking Head: Claudius’ Movement Disorder.” Journal Of The Royal Society Of Medicine 93 (April 2000), 198. Shelton, Jo-Ann. As the Romans Did: A Source Book in Roman Social History. 2nd ed. New York: Oxford University Press, 1998, 26-29. Le Glay, Marcel, Jean-Louis Voisin, and Yann Le Bohec. A History of Rome. Cambridge, MA, USA: Blackwell, 1996, 264-265. Cary, M. A History of Rome down to the Reign of Constantine. 3rd ed. London: Macmillan, 1975, 355. [17 & 18] Suetonius, 10-11/Graves, 184. Suetonius, 15 & 39/Graves, 186 & 202. Rice, Jane E. “The Emperor with the Shaking Head: Claudius’ Movement Disorder.” Journal Of The Royal Society Of Medicine 93 (April 2000), 200.